The all new The 91 Days to Greatness WORKBOOK is your step-by-step road map to network marketing superstardom! 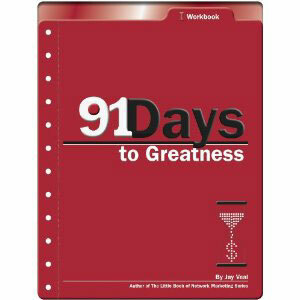 The companion to 91 Days to Greatness the book, this workbook is a must have to any network marketer serious about massive and immediate action! If you have the will to win, and the passion to take the consistent and persistent action necessary for mlm greatness this is the accountability and duplication tool for you. Employ this system, teach it to your team, and hold on for the ride.